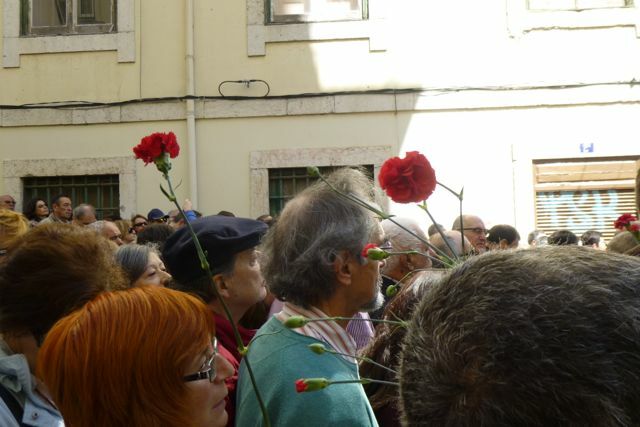 One of my main reasons for coming to Portugal this month was to witness and celebrate the 40th anniversary of the Carnation Revolution that toppled the country’s fascist dictatorship on April 25, 1974. The 40th anniversary is especially significant because it’s probably be the last time the major participants in the revolution will still be alive to tell their stories of that remarkable day. It began in the predawn hours when troops of the MFA (Armed Forces Movement) led by Captain Fernando José Salgueiro Maia occupied the Ribeira das Naus and the Terreiro do Paço along the riverbank and ultimately convinced forces loyal to the government to join them. Within hours, ordinary people flooded into the streets and placed carnations in the rifles of the rebel soldiers, showing that their guns would no longer be used against the people. 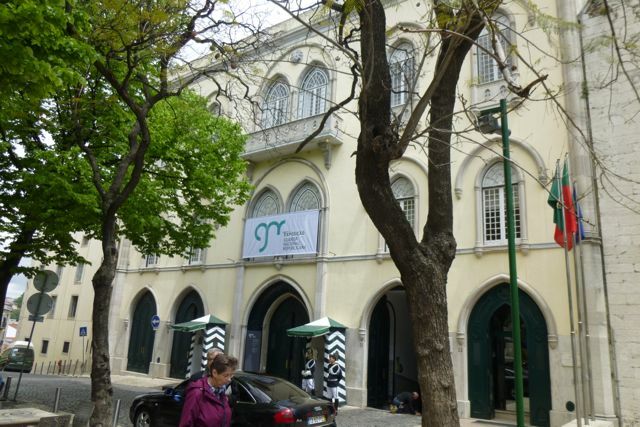 Following a tense afternoon standoff, the fascist government of Marcelo Caetano, successor to notorious despot António de Oliveira Salazar, surrendered at the headquarters of the Guardia Nacional. The following day, April 26, the civilian pro-democracy leaders returned from exile. 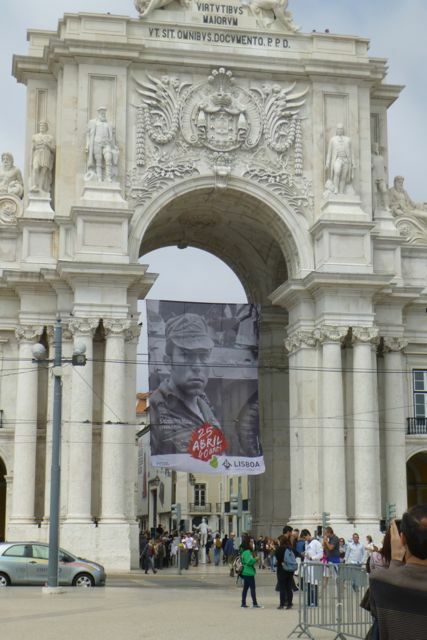 A banner honors the late revolutionary leader Salgueiro Maia. Already, two of the principal heroes of the revolution are no longer with us. Captain Salgueiro Maia died of cancer in 1992 at the age of 47. And José “Zeca” Afonso, the popular musician who composed the revolutionary anthem “Grândola Vila Morena” died in 1987 at the age of 57 after a five-year battle with ALS. Tributes to both Salgueiro Maia and Zeca abounded during this anniversary celebration. 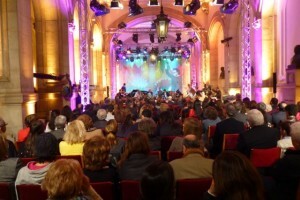 On Thursday evening, April 24, I attended a concert at the Assembly of the Republic building that featured Zeca’s music. 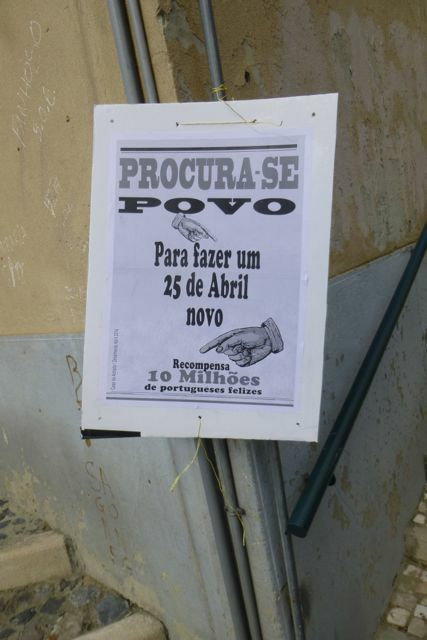 A sign outside announced that the concert would be filmed for RTP2, one of the national TV channels. 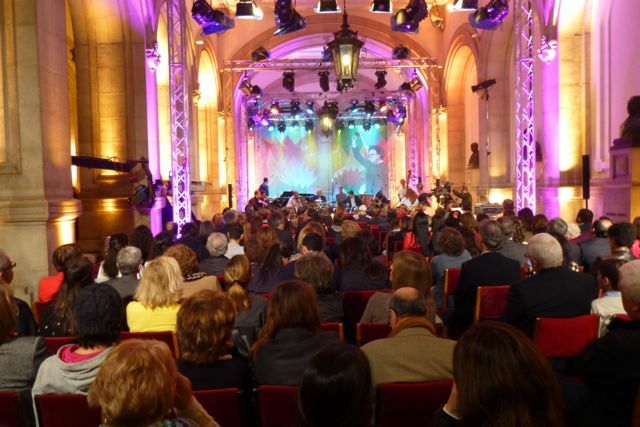 Looking through the program, I noticed that many of the performers were themselves members of that legislative body, among them, on Portuguese guitar and rhythm guitar, the deputy Nuno Encarnacão, who also wrote an eloquent tribute to Zeca. The building of the Assembly of the Republic, with a banner announcing the tribute to Zeca Afonso. I never thought I’d ever see members of a national legislature publicly performing the songs of a revolutionary folk singer. However, these legislators owe their positions in large part to this revolutionary folk singer who sacrificed much for the cause of democracy. Dictatorships don’t need legislatures. Or if legislatures do exist, as in Portugal under fascism, they’re handpicked by the rulers and serve as rubber stamps rather than as voices for the people. With musicians in place, the audience inside the Assembly building awaits the start of the concert. At the Largo de Carmo listening to speeches by critics of the current government, which would have been impossible under the dictatorship. I’m sure it’s going to look great on TV, and you’ll be able to see the concert on YouTube as well. You’re welcome to look for me. I sat behind a tall man in a suit. On Friday morning, Richard and I walked to the Largo de Carmo, in front of the Guardia Nacional headquarters, where we heard some of the military veterans of the revolution comment on struggles yesterday and today, specifically the need to resist rolling back the social and economic gains of the past 40 years to please banks and business leaders. Most of the people wore or carried red carnations in homage to the day. 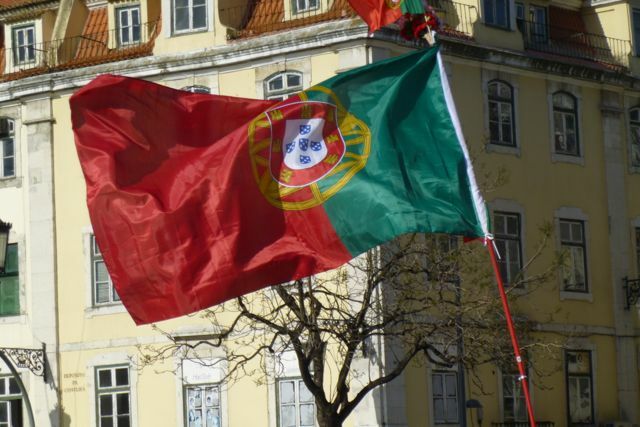 I kept thinking of one of the poems read at the Zeca tribute, calling the colors of freedom green and red—the colors of the carnations but also of the Portuguese flag. 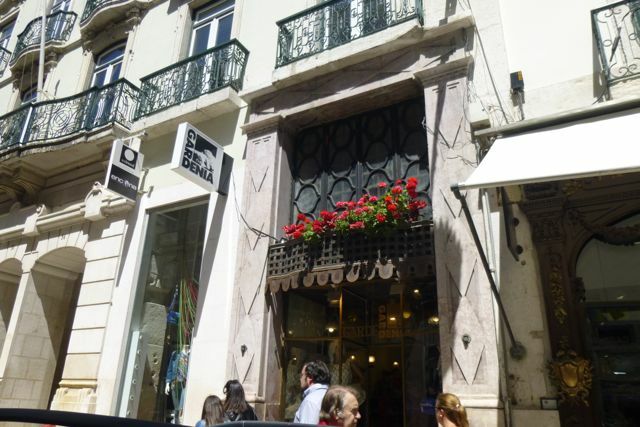 I bought a carnation and wore it to the end of the short but very crowded march down Avenida Liberdade to Rossio Square in the afternoon. 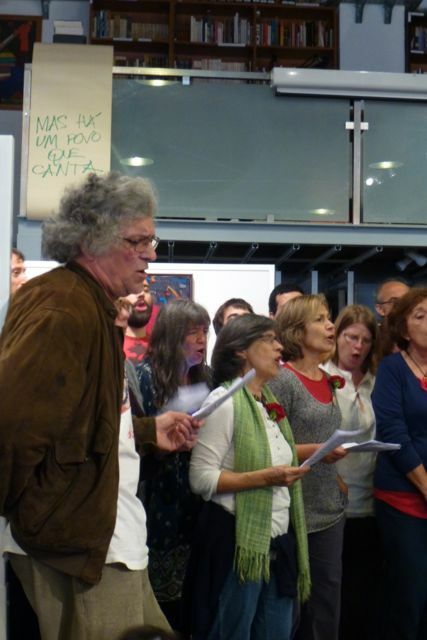 Afterward, Richard and I took the short path up multiple flights of stairs to the Casa da Achada, where our friend Joana, who rented us the apartment where we stayed in 2012, was performing as part of a revolutionary choir. A Portuguese flag flaps in the wind at the end of the march in Rossio Square. The Casa de Achada is a wonderful community center for the neighborhood of Mouraria, just east of downtown. 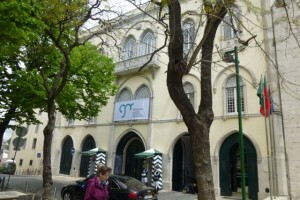 It features libraries for children and adults, a playground, space for exhibition and performances, and an active schedule of events and classes. 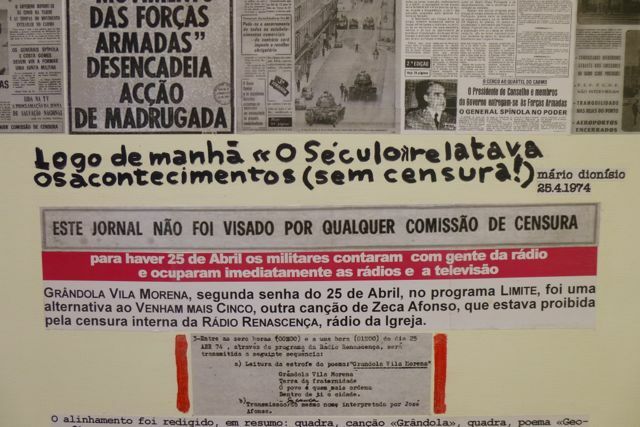 When we were there, the exhibition space featured paintings by revolutionary artist and essayist Mário Dionisio, and outside were billboards with quotations and artifacts showing life under the dictatorship and the joy of a people experiencing their first days of freedom. 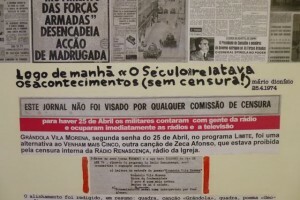 A poster at the Casa da Achada describes the end of censorship after the Carnation Revolution. If you’re reading this post in a country where you’ve never known anything but freedom, it may be hard to imagine what it’s like to live without it. 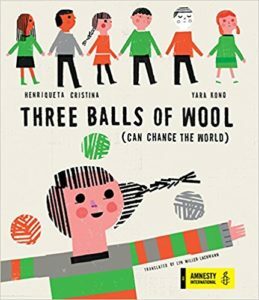 In Portugal under the dictatorship, for instance, children were not required to attend school beyond the age of eight, and one-third of the country was illiterate. Boys and girls went to separate schools. Students who arrived late, broke the rules, or gave certain wrong answers received harsh physical punishment. Religion was central to the classroom and school day even in public schools. Teachers could not marry without permission from the Ministry of Education, a restriction that extended to many other jobs as well. Women were considered the property of their husbands and could not travel outside the country without their husbands or notarized and officially-approved permissions from their husbands. Women had no reproductive rights, because having babies was considered an interest of both their husbands and the State. A choir performs in the evening at the Casa da Achada. Our friend Joana is at the right end, in the red dress. The indignities large and small of life under dictatorship went on and on. 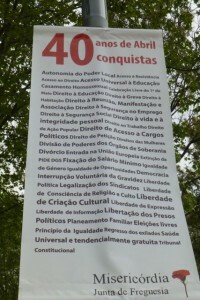 In addition, the small, impoverished country (in large part because the dictator wanted the people to remain ignorant and unskilled to be easier to control) was mired in wars against liberation forces in Angola, Guinea-Bissau, and Mozambique, wars that resulted in nine thousand Portuguese dead and more than 100,000 wounded, and many more casualties among the various African peoples. The MFA consisted in large part of officers radicalized by their time in Africa—as was Zeca, who spent much of his childhood in Mozambique and later married a Mozambican woman. 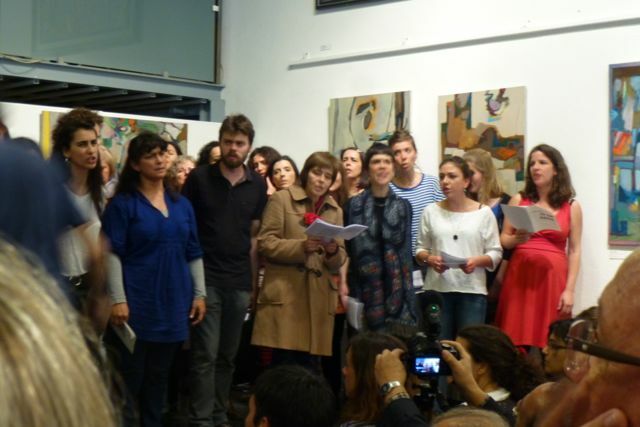 Choir at the Casa da Achada. We had a long and memorable day honoring these brave revolutionaries, whose peaceful removal of an oppressive regime and restoration of democracy captivated the world 40 years ago. We also understand that the struggle continues, and protecting democracy—rule by the people—against power-hungry despots and bean-counting plutocrats requires that we do not rest, and we do not retreat. Enjoy these other photos from the 40th anniversary, April 25, 2014. 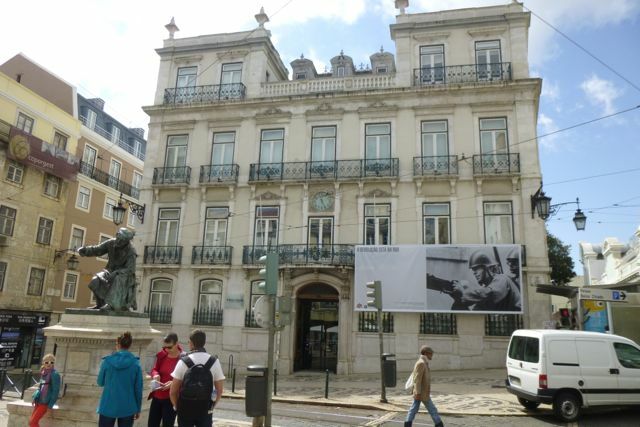 The GNR (National Guard of the Republic) headquarters in Largo de Carmo, where the fascist government of Marcelo Caetano surrendered on the afternoon of April 25, 1974. 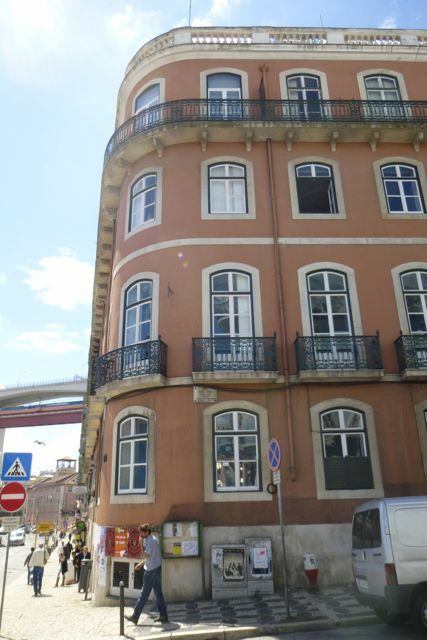 The corner of Rua Dias Coelho and Calvário, near the LX Factory. 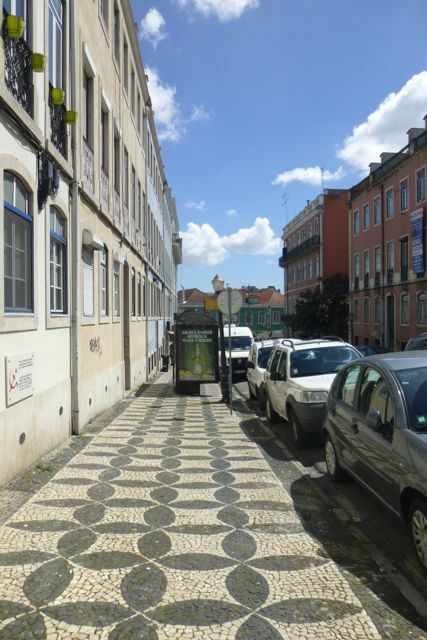 Rua Dias Coehlo was renamed after the revolution for an artist assassinated by the PIDE (fascist secret police) in 1961. The headquarters of the former fascist secret police, the PIDE/DGS. 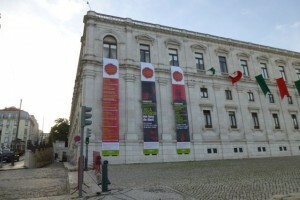 Today, a banner announces an outdoor exhibit throughout Lisbon of photographs that chronicle the events of April 25, 1974. The struggle continues. 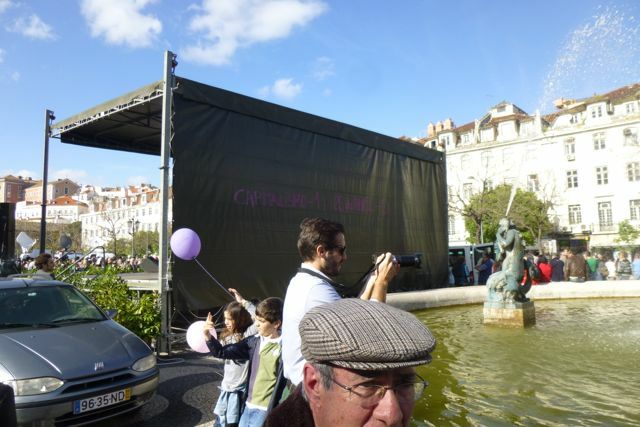 Graffiti at the parade’s end in Rossio Square reads, “Capitalism – 1; the 25th of April – 0. Dear Lyn,you look like one of us and know the story of our democracy better then many Portuguese political leaders. Thank you, Luís. Coming from you, that is a true honor! Anniversaries can let people understand their history and the choices they still have today. hopefully the 40th of April 25 will do that for the Portuguese people. I agree! There seems to be more engagement in Portugal than I’ve seen in other places, where the anniversary is merely an opportunity for a day off and entertainment. There are real debates about the direction of the country and the fact that freedom from government dictatorship doesn’t mean freedom from the Troika or efforts by the corporation elite to undermine hard-won rights. Thank you so much for this fabulously reported blog on the anniversary of the revolution, Lyn. I’m glad you liked it, Sandra! I wanted to provide something for folks who couldn’t be there.